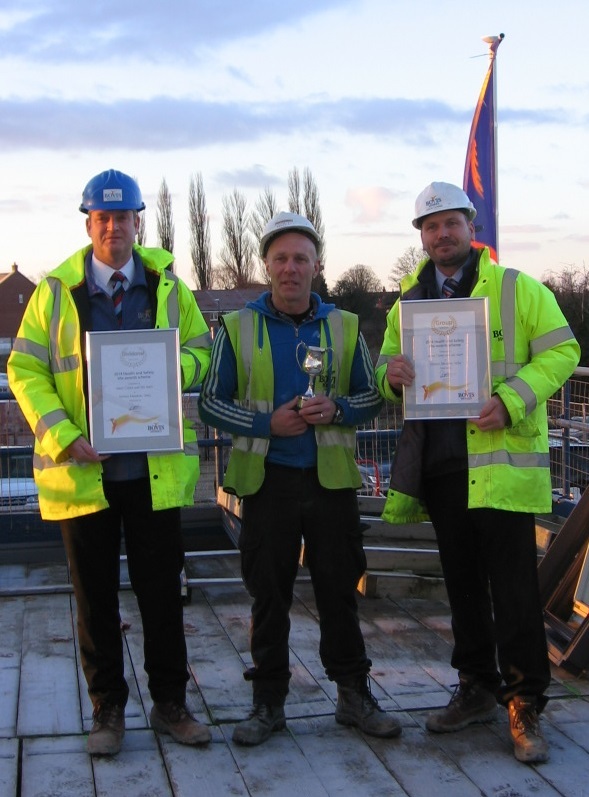 Site manager Jason Clarke has been named winner of the annual national Bovis Homes Health and Safety award for his outstanding work at Holmes Meadow in Selby. Holmes Meadow is the most northern of all Bovis Homes locations around the country and proved itself top of the Health and Safety world as well, thanks to Jason's attention to detail and commitment to the safety of people on his site. Jason and his team, including trainee assistant site managers Damien Jones and Karl Tierney and materials controller Phil Hickman, received their awards at the site from Bovis Homes Chief Executive David Ritchie. Northern Build Director, Jim Brooks, said: "This is a fantastic accolade for Jason and his team and is an exceptional achievement. "It is a testament to the hard work and dedication of the committed project team in place, led expertly by Jason, who have endeavoured to ensure the safety of all people on site at Selby." Jason won the award after his Selby site was rated top in the business - beating almost 100 other site managers - by a judging panel including David Ritchie and Bovis Homes Group Environment, Health and Safety Director Paul Haxell. Paul said of Jason's work: "Jason has demonstrated his own leadership skills and desire to achieve high standards of health and safety, and is receiving good support from both his colleagues and the contractors on site at Selby." Other site managers recognised for their excellent health and safety performances included Sean Gibbs at Priors Lea in Paulton, Tony Burns at Heyford Park, Upper Heyford, Colin Macleod from Windmill View in Clanfield, Gary Uzzell at Letcombe Fields, Wantage and James Barratt who is in charge at Oakford Grange in Telford. For more information about Bovis Homes and Holmes Meadow, go to www.bovishomes.co.uk.